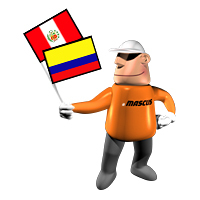 Mascus www.mascus.co.uk, the world’s leading online marketplace for construction, agriculture, material handling, forestry, grounds care machinery and transportation vehicles proudly announces its collaboration with the publishers of the leading construction and mining magazines of Latin-America. With nearly 40 years of experience in the region, Construcción Pan-Americana (CPA) and Minería Pan-Americana (MPA) offer the knowledge to make Peru & Colombia successful markets for the buyers and sellers of equipment in these countries. Since being established in 2000, Mascus has quickly expanded and is now present in 41 countries. This online hub seamlessly connects dealers, producers and end-users making it an integral part of used equipment sales in the global market. According to the Association of Equipment Manufacturers (AEM), the market for exports of U.S.-made construction machinery closed 2010 with an increase of more than 28% compared to 2009. Colombia and Peru closed out 2010 in the top 10 with $588 million (up 50%) and $437 million (up 37%) respectively. These figures demonstrate the importance of these Latin-American countries as key players in the industry. The booming construction industry in Latin America may be attributed to the constant need to improve the region’s infrastructure. Although often a volatile region, it also boasts rapid growth and development, even in face of the recent financial downturn. Emerging markets are proven to be the stimulant for growth for most global companies and both Colombia and Peru fit the description. Opening more offices in Latin America reflects our strategy to build the first Pan-American marketplace for heavy machinery and transportation vehicles. Our multi-local presence approach means that in each of the 41 countries where Mascus is present there are people who will take care of serving the needs of local sellers and buyers and perform the necessary local marketing activities to promote our customers’ advertisements not only on the internet but also in offline world. “No one else can offer the same,” adds Fredrik Larsson, Managing Director of Mascus. “We are only midway through the process of building our presence in the region; next in line is the opening of our new offices in Mexico, Brazil, Argentina and Chile, “adds Tomasz Odrobinski, Mascus Internationalization Director.